Background: Bronchopleural fistula (BPF) complicating lung tumor ablation is rare but severe. The purpose of this article was to study its characteristics and treatments. Materials and Methods: Two of 682 (0.3%) sessions of lung microwave ablation (MWA) were complicated with BPF and documented. Two electronic databases were searched for reported cases of BPF after lung tumor ablation. Case selection and data collection were done by 3 independent reviewers. Results: A 56-year-old man and a 61-year-old woman developed BPF after MWA and died. Thirteen cases (mean age 63.8, 61.5% male) of BPF with adequate information were identified from 8 articles. Of the 13 cases, 5 (38.5%) had pulmonary co-morbidity, 3 (23.1%) had a history of pulmonary surgery, 7 (53.8%) had a target tumor adjacent or abutting pulmonary pleura, and 6 (46.2%) developed severe infections. After chest tube placement, pleurodesis, endoscopic therapy, surgery, and other treatments, 12 were cured and 1 died of BPF and pneumonia. Conclusion: BPF is a rare but severe complication of lung ablation, and the management needs a multidisciplinary and individualized treatment strategy. Objective: To investigate the expression level of miR-142-5p and its potential target gene endothelial PAS domain protein 1(EPAS1) in Stage III colorectal cancer during Transcatheter arterial infusion chemotherapy (TAI). 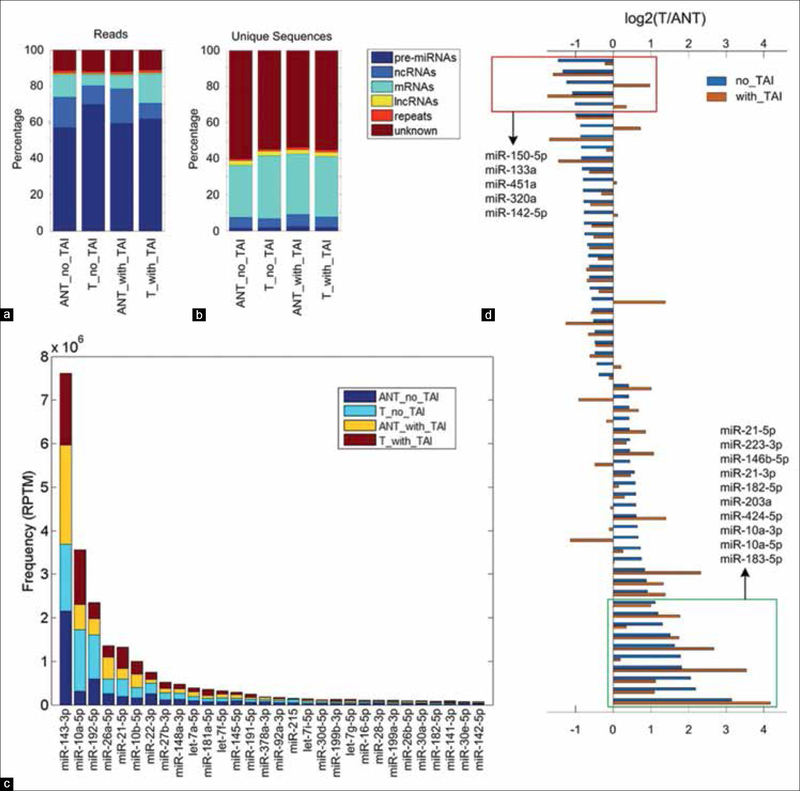 Materials and Methods: Illumina high-throughput sequencing was used to obtain miRNA expression profiles of paired tumor and adjacent normal tissues from one patient received TAI 1 week before the operation and another patient directly underwent an operation. The expression levels of miR-142-5p was measured with both high-throughput sequencing and quantitative real time-polymerase chain reaction. Results: The expression levels of miR-142-5p, were significantly reduced in tumor tissues of stage III CRC, then significantly increased in tumor tissues receiving TAI and higher than tumor tissues without TAI. The apoptosis rate of HT-29 colon cancer cells was mildly increased after transfection with pre-miR-142. miR-142-5p could bind directly to the 3′untranslated region of endothelial PAS domain protein 1 and reduce its expression. Conclusions: miR-142-5p is a potential tumor suppressor in CRC and is upregulated in tumor tissues after TAI, suggesting its potential clinical values for testing the functionality of TAI and predicting the progress of CRC. Background: We aimed to assess the clinical outcome of computed tomography (CT)-guided percutaneous microwave ablation (MWA) in patients 75 years of age and older with early stage peripheral nonsmall cell lung cancer (NSCLC). 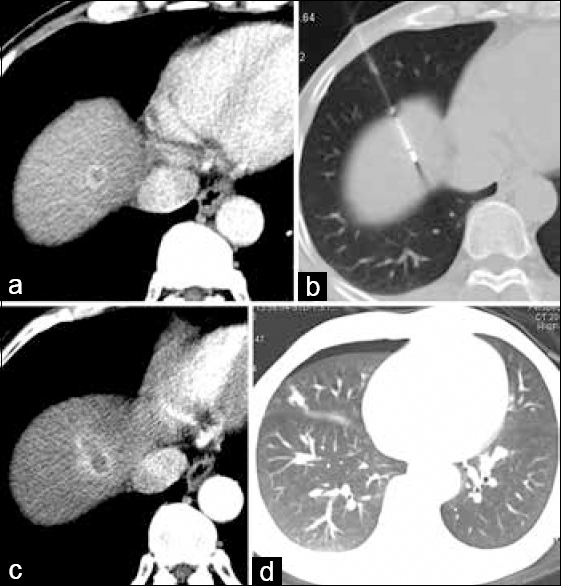 Materials and Methods: Twenty-eight patients, aged ≥75 years, with Stage I and lymph node-negative IIa peripheral NSCLC underwent CT-guided percutaneous MWA in our hospital between July 2007 and March 2015. The overall 1-, 2-, 3-, and 4-year survival rates were estimated using Kaplan–Meier analysis. Adverse events were recorded. Results: The median follow-up time was 22.5 months. The overall median survival time (MST) was 35 months (95% confidence interval [CI] 22.3–47.7 months), and the cancer-specific MST was 41.9 months (95% CI 38.8–49.9 months). The 1-, 2-, 3-, and 4-year overall survival rates were 91.7%, 76.5%, 47.9%, and 47.9%, while the cancer-specific survival rates were 94.7%, 73.9%, 64.7%, and 64.7%, respectively. Median time to local progression was 28.0 months (95% CI 17.7–38.3 months). Major complications were included pneumothorax (21.4%, requiring drainage), pleural effusions (3.6%, requiring drainage), and pulmonary infection (3.6%). Conclusions: CT-guided percutaneous MWA is safe and effective for the treatment of patients 75 years of age and older with medically inoperable early stage peripheral NSCLC. Background: Patients suffering local recurrence of colorectal cancer which cannot be surgically removed are troubled with severe pain and poor quality of life. 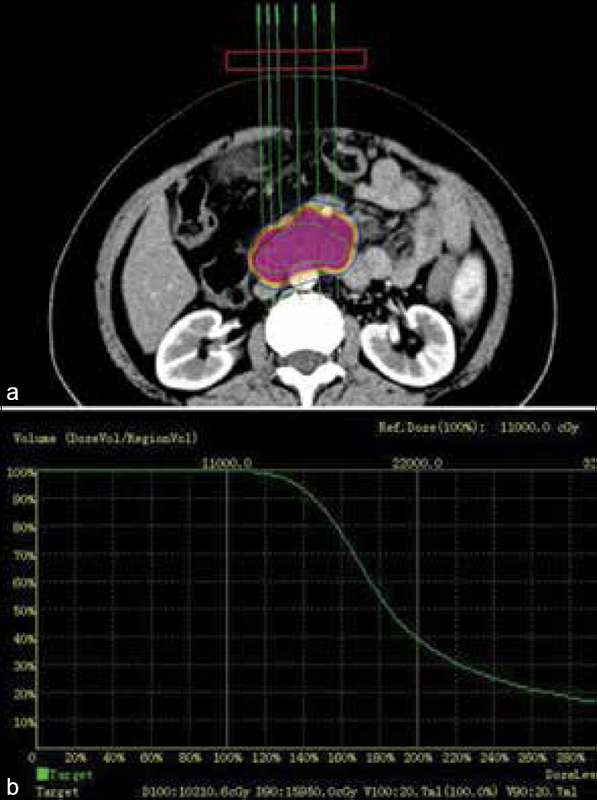 The aim of this study is to evaluate the efficacy and safety of computed tomography (CT)-guided microwave ablation (MWA) as palliative treatment for recurrent unresectable colorectal cancer. Materials and Methods: Thirty-one patients were suffering locally recurrent colorectal cancer underwent MWA with CT guidance. The MWA power was set at 60–80 W, 6–8 min. Effectiveness was evaluated by visual analog scale (VAS) with a follow-up of 6-month. Complications were also recorded. Results: Technical success was achieved in all patients. Mean VAS preprocedure was 7.10. Mean VAS postprocedure were as follows: 1 week, 2.65 (P < 0.001); 1 month, 0.81 (P < 0.001); 3 months 0.45 (P < 0.001); and 6 months 0.19 (P < 0.001). No serious complications were observed including intestinal fistulas, bladder fistulas, or peripheral vascular or nerve injury. Conclusions: CT-guided MWA as treatment of recurrent colorectal cancer can quickly and effectively relieve pain. It is a minimally invasive, safe, and efficient palliative treatment of recurrent colorectal cancer. Background: Neoplasm abutting the diaphragm is one kind of the special sites of liver neoplasms treated with radiofrequency ablation (RFA), the purpose of this study is to evaluate the feasibility and safety of computed tomography (CT)-guided RFA of liver neoplasms abutting the diaphragm with multiple bipolar electrodes sequentially passing through the lung parenchyma. 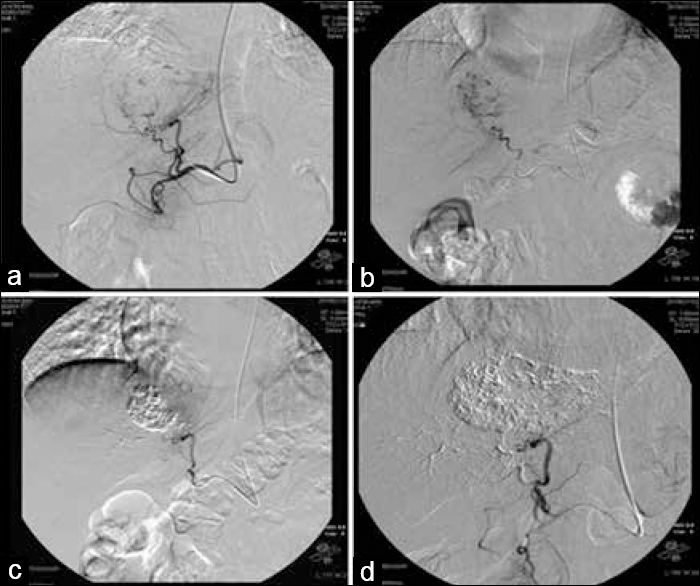 Materials and Methods: 37 patients were treated with transpulmonary CT-guided RFA. Technical success rate, perioperative complications, and local tumor progression were investigated. Results: The number of electrode (s) sequentially passing through the lung parenchyma (NPLP) was 1 electrode in 20 patients, 2 electrodes in 14 cases, and 3 electrodes in 3 cases. Technical success rate was 100%. The most of the perioperative complications were self-limiting and mainly included pneumothorax (11 cases, 2 needed percutaneous drainage), hemorrhage of the electrode track in the lung parenchyma (6 cases), a small amount of hemoperitoneum in perihepatic space (8 cases) and discomfort of the right shoulder (7 cases). 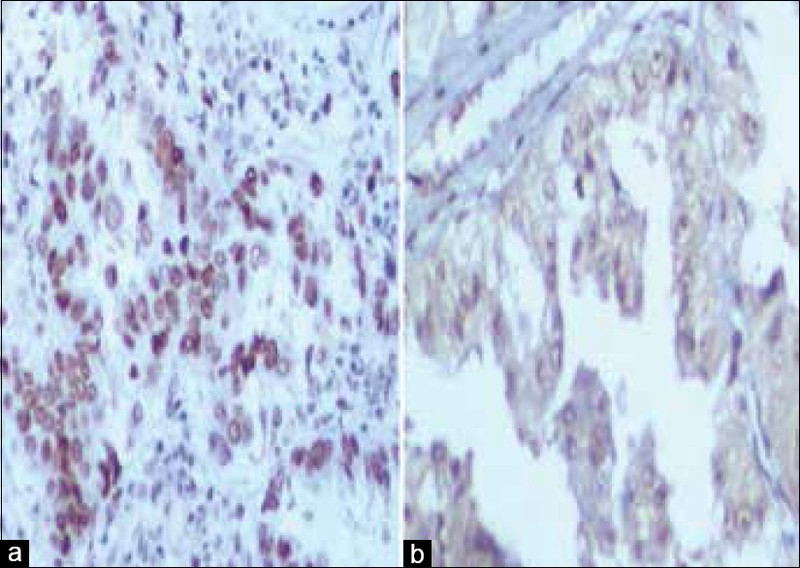 Local tumor progression occurred in 6 cases during the follow-up (3–12 months). Multivariate logistic regression analysis showed that the incidence of pneumothorax was not related to NPLP (P = 0.50), length of the electrode (s) in the lung parenchyma (P = 0.18), types of anesthesia (P = 0.10), and indwelling time of the electrode (s) in the lung parenchyma (P = 0.28). Conclusion: CT-guided RFA of liver neoplasms abutting the diaphragm with multiple bipolar electrodes sequentially passing through the lung parenchyma is a feasible and safe therapeutic option. 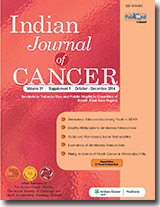 Background: To examine the safety and clinical efficacy of computed tomography (CT)-guided radioactive iodine-125 (125I) seeds implantation for patients with unresectable pancreatic cancer. 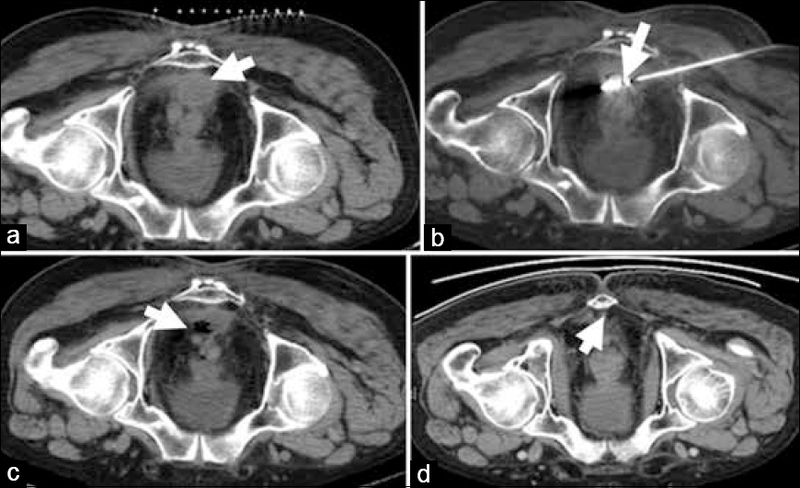 Materials and Methods: A group of 26 patients with pathologically confirmed unresectable pancreatic cancer underwent percutaneous CT-guided 125I seeds implantation. Part of them received transarterial chemotherapy and/or percutaneous transhepatic cholangial drainage before or after seeds implantation. The primary endpoints were the objective response rates, local control rates, and overall survival. Results: CT scan 2 months after treatment revealed complete response (CR) in 8 patients, partial response (PR) in 9 patients. Overall response rate (CR + PR) is 65.38%. Local control rate was 88.46%. Median survival of the whole group was 15.3 months, whereas for Stage III and IV was 17.6 and 9.1 months, respectively. The estimated 1-year survival was 30.77%. Conclusions: We consider CT-guided 125I seeds implantation as a safe, effective, uncomplicated treatment for unresectable pancreatic cancer. Objective: We investigated the outcomes of patients with multiple ground-glass nodules (GGNs) to identify the role of video-assisted thoracoscopic surgery (VATS) in diagnosis and treatment. Patients and Methods: We included patients with multiple GGNs who were qualified for thoracoscopic surgery resection and analyzed the statistics. Results: Fifty-one GGNs were detected in 21 patients. There were 40 pure GGNs and 11 part-solid ones. Around 46 of the 51 lesions were resected via VATS. Four pure GGNs <10 mm and deep in the lung were proceeded with continuous follow-up. One pure GGN measuring 16 mm considered as subnodule and also deep in the lung underwent stereotactic ablative radiotherapy. Resection methods included lobectomy (1), segmentectomy (1), lobectomy + segmentectomy (6), lobectomy + wedge resection (10), and segmentectomy + wedge resection (3). Of the 46 resected lesions, 4 (8.7%) were atypical adenomatous hyperplasia (AAH), 23 (50%) were adenocarcinoma in situ(AIS), 15 (32.7%) were minimally invasive adenocarcinoma (MIA), 2 (4.3%) were invasive adenocarcinoma, one was pulmonary sclerosing hemangioma, and one was nonspecific fibrosis. Intersegmental lymph node metastasis was found in one of the 21 patients. No postoperational complication occurred in any of the patients. Conclusion: Multiple GGNs were generally independent primary lung cancers, mainly including AAH, AIS, MIA, rather than intrapulmonary metastasis. VATS was superior to thoracotomy for less invasive and shorter hospital stay. Background: When microwave ablation (MWA) is used for subpleural lesions, severe pain was the common side effect under the local anesthesia conditions during the procedure and postprocedure. To study the pain relief effect of artificial pneumothorax in the treatment of subpleural lung tumors with MWA. 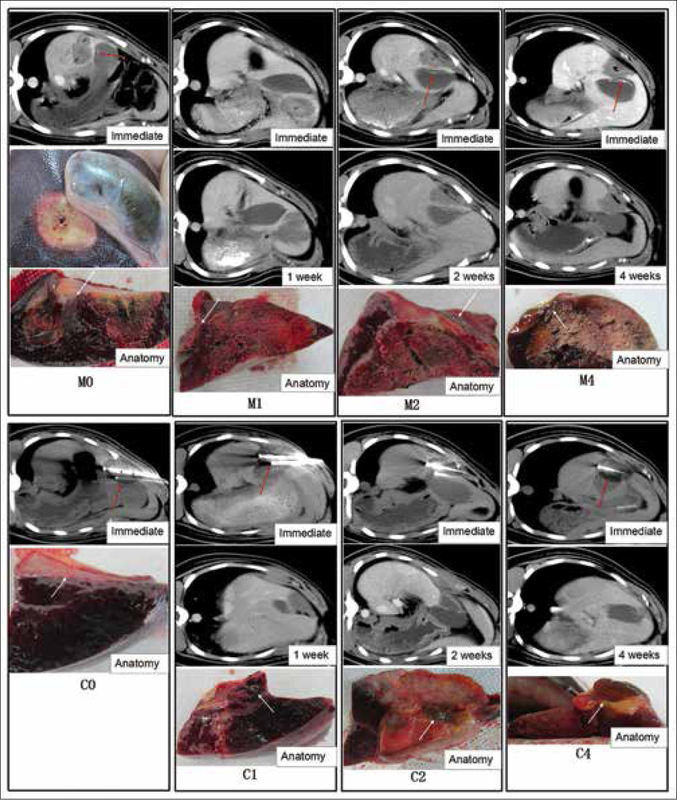 Materials and Methods: From February 2012 to October 2014, 37 patients with 40 subpleural lung tumors underwent MWA, including 17 patients of 19 sessions given artificial pneumothorax prior to MWA (group-I), and 20 patients of 21 sessions without artificial pneumothorax (group-II). Patient's pain assessment scores (10-point visual analog scale [VAS]) at during-procedure, 6, 12, 24, and 48 h after the MWA procedure and mean 24 h morphine dose were compared between the two groups. Complications of the artificial pneumothorax were also summarized. Results: Pain VAS were 0.53, 0.65, 1.00, 0.24, and 0.18 at during-procedure, 6, 12, 24, and 48 h for group-I and 5.53, 2.32, 2.82, 1.21, and 0.21 for group-II, respectively. Pain VAS in group I was significantly decreased at during-procedure, 6, 12, and 24 h after the MWA (P < 0.001). No statistical pain VAS difference was observed at 48 h after the MWA between the two groups (P > 0.05). The mean 24 h morphine dose was 5.00 mg in group-I and 12.63 mg in group-II (P = 0.000). 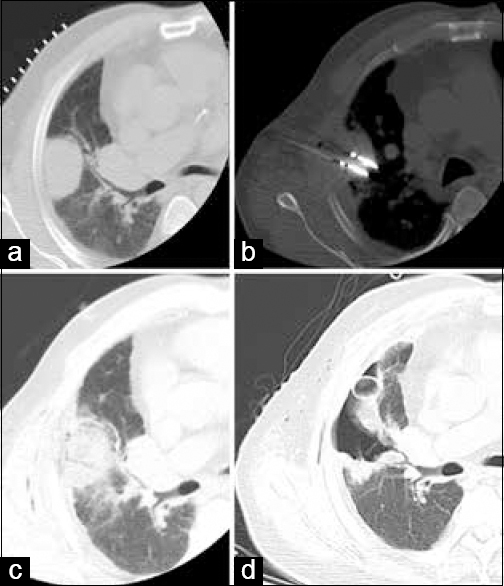 “Artificial pneumothorax” related complications occurred in two patients from group-I, including one pleural effusion and one minor hemoptysis. No patient in group-I and group-II died during the procedure or in 30 days after MWA. Conclusion: Artificial pneumothorax is a safe and effective method for pain relief during MWA of subpleural lung tumors. Purpose: To compare the imaging, anatomy, and histopathology of the porcine liver tissue adjacent to the gallbladder, as well as the temperature of the gallbladder wall and the damage degree of gallbladder wall at different times after microwave ablation (MWA) and cryoblation. Materials and Methods: Sixteen pigs were randomly divided into MWA group (Group M) and cryoblation group (Group C). The pigs were randomly divided into 8 subgroups according to their execution time, with 2 pigs in every subgroup. The pigs were executed immediately after operation, or at 1-, 2-, and 4-weeks postoperatively according to their assigned subgroup. The imaging and anatomy change of the liver ablation zone and the gallbladder wall were recorded. Histopathological observation was carried out for the damage portion of the gallbladder and the adjacent liver parenchyma. Results: (1) There were no significant statistical differences of the damage degree of the gallbladder between the two groups (P = 0.842). (2) Gallbladder wall edema occurred in Group M immediately after ablation (6/8), of which, 3 cases of gallbladder wall reached full-thickness damage; overlapping of ice ball and gallbladder wall occurred in Group C (5/8), of which, 4 cases of gallbladder wall reached full-thickness damage. However, there was neither perforation of gallbladder, biliary fistula, nor liver abscess in all cases. Conclusion: Both MWA and cryoablation for liver tissues adjacent to the gallbladder could lead to different damage degrees of the gallbladder wall, but not gallbladder perforation even under the condition of full-thickness damage. Background: The objective of this retrospective study was to evaluate the safety and efficacy of percutaneous microwave ablation (MWA) for treating lung metastases from nasopharyngeal carcinoma (NPC). 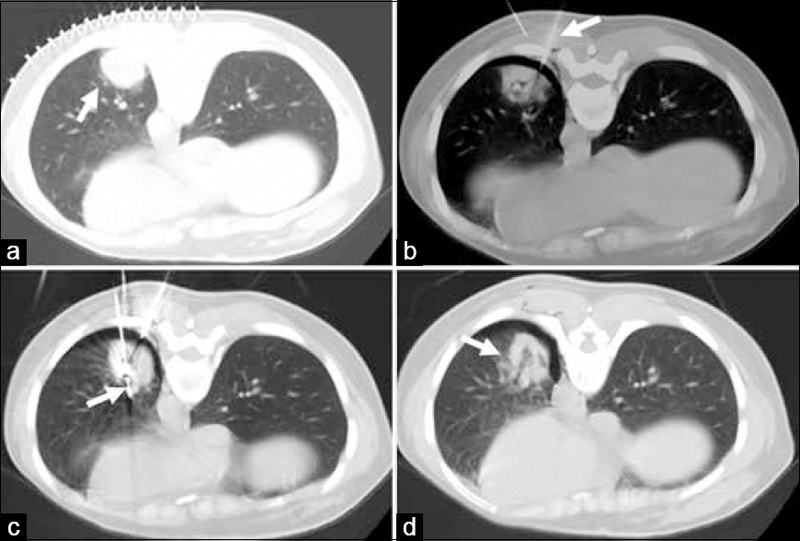 Patients and Methods: From December 2012 to November 2014, 17 patients (15 males, and two females, averaged 45.7 years old) with lung metastases from NPC accepted computed tomography (CT)-guided percutaneous MWA. The average number of lung metastases was 1.7 (range: 1–4), and the biggest tumor diameter was 4.2 cm (range: 0.8–4.2 cm). Nineteen nodules located in the right lung and 10 nodules located in the left lung. A total of 29 ablation sites were performed to 29 lung metastases in 22 MWA sessions. Postoperative assessments of complete tumor necrosis rate, safety, local tumor progression, and survival period were carried out. Results: Of the 29 lesions, complete response was achieved for 27 lesions; residual tumor was found in one lesion 3 months postoperatively; and another lesion was found enlarged 3-month postoperatively with obvious enhancement. Four patients had a small amount of postoperative parenchyma bleeding and two patients had a small amount of pneumothorax. Six months after MWA treatment, new metastatic lesions appeared in six patients, five patients had new metastatic lesions inside the lung, and the other patient had metastatic lesions in the thoracic vertebra. The time for the appearance of new pulmonary metastases for the five patients was 4–20 months, averaged 7.2 months. Conclusion: CT-guided MWA is a promising treatment alternative for local tumor control in selected patients with lung metastases from NPC. Objective: To evaluate the diagnostic value of bronchial lavage P16INK4A promoter methylation and lung cancer. Materials and Methods: The databases of PubMed, Medline, China National Knowledge Infrastructure, and Wanfang were electronically searched by two reviewers to find the suitable studies related to the association between P16INK4Apromoter methylation and lung cancer. The P16INK4Apromoter methylation rate was extracted from each included individual study. 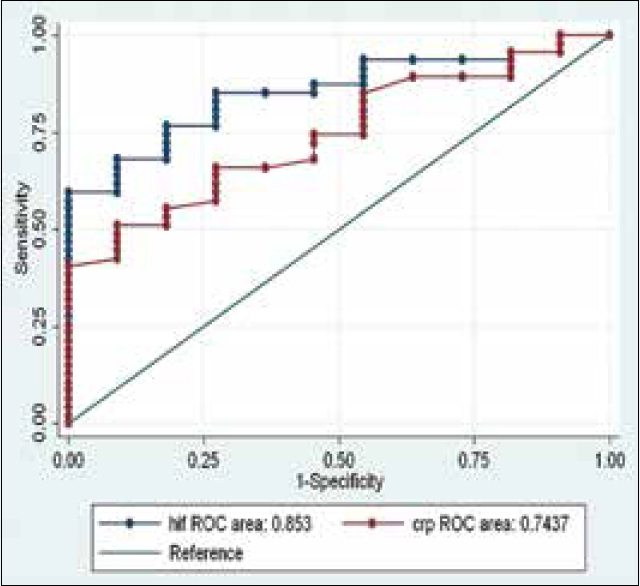 The diagnostic sensitivity, specificity, and area under the receiver operating characteristic ROC curve of bronchial lavage P16INK4Aas a biomarker for diagnosis of lung cancer were pooled by stata11.0 software (Stata Corporation, College Station, TX, USA). Results: At last, 10 publications were included in this meta-analysis. 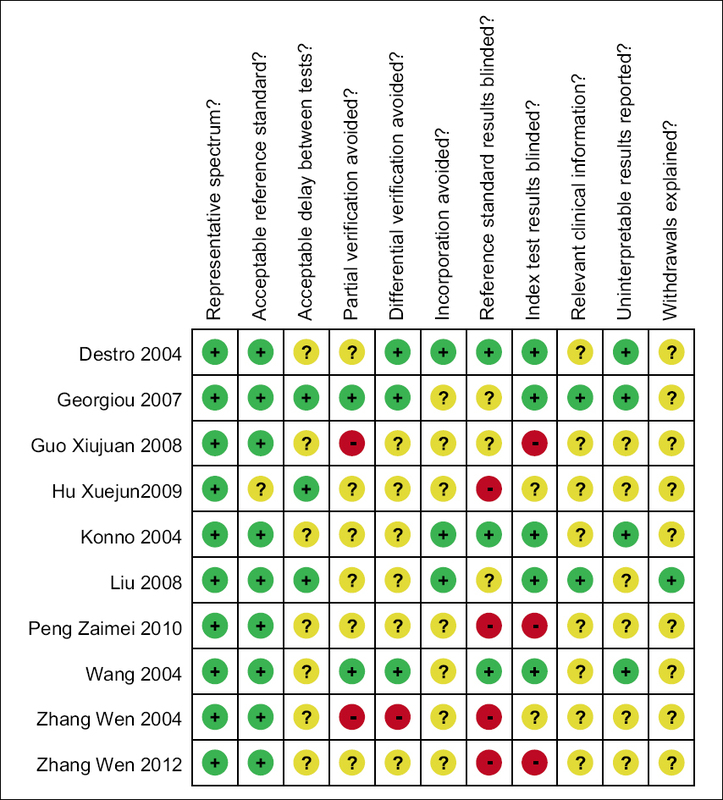 Of the included 10 studies, five are published in English with relatively high quality and other five papers published in Chinese have relatively low quality. The pooled sensitivity and specificity of bronchial lavage P16INK4Apromoter methylation for lung cancer diagnosis were 0.61 (95% confidence interval [CI]: 0.57–0.65) and 0.81 (95% CI: 0.78–0.85), respectively, with random effect model. The ROC curve were calculated and drawn according to Bayes' theorem by stata11.0 software. The systematic area under the ROC was 0.72 (95% CI: 0.68–0.76), which indicated that the diagnostic value of bronchial lavage P16INK4Apromoter methylation for lung cancer was relatively high. 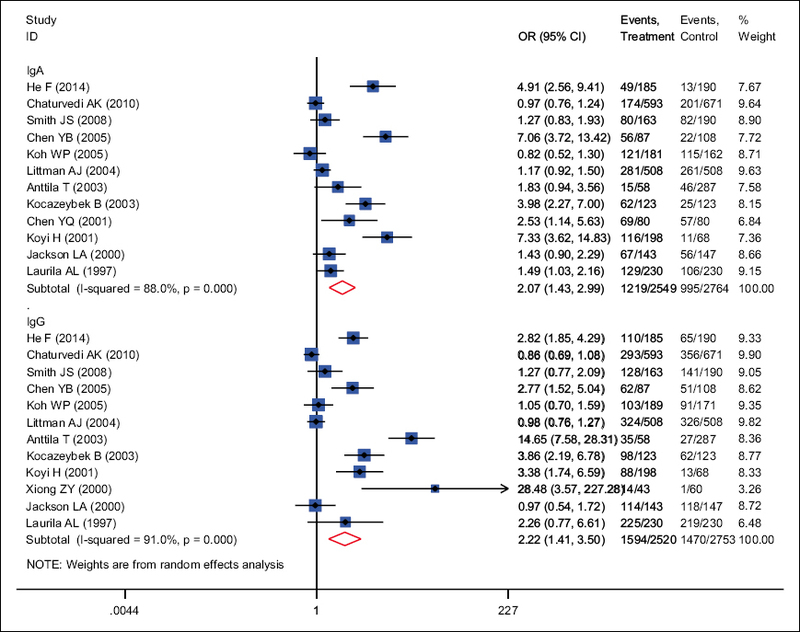 Moreover, no significant publication bias was existed in this meta-analysis (t = 0.69, P > 0.05). Conclusion: Bronchial lavage P16INK4A promoter methylation can be a potential biomarker for diagnosis of lung cancer. Objective: The aim of this retrospective study was to evaluate the clinical efficacy of transcatheter arterial chemoembolization (TACE) combined with surgery in the treatment of hepatocellular carcinoma. Methods: We retrospective included 89 cases of primary hepatocellular carcinoma in the Department of General Surgery of Fuzhou Infection Hospital from January 2012 to December 2014. For the included 89 subjects, 38 cases received surgery (control group) and other 51 patients received operation followed by postoperative TACE (experiment group). 3 months after the operation, the objective response rate (ORR) and disease control rate (DCR) were compared between the two group. Moreover, the Kaplan–Meier survival curve was used to evaluate the long-term survival of the two groups. Results: Three months after the operation, the objective response was evaluated for the two groups. The ORR and DCR were 55%, 74% for the control group and 78%, 92% for the experiment group with significant difference between the two groups (P < 0.05); the median survival time was 13. 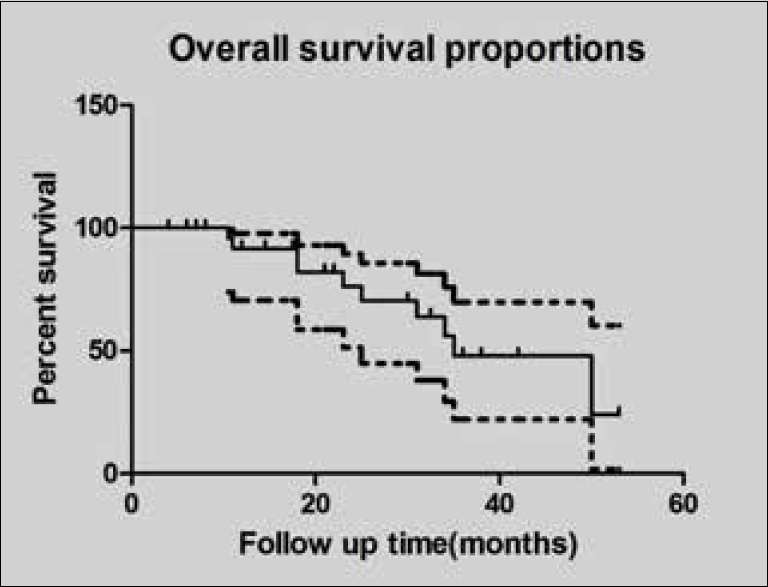 10 months with 1- and 2-year survival rate of 50% and 21% in the control group; the median survival time was 16.40 months with 1- and 2-year survival rate of 63% and 39% in the experiment group. The hazard ratio was 1.66 with it 95% confidence of 1.05–2.83, which indicated that the patients in the experiment group have less risk of death in the period of follow-up (P < 0.05). Conclusion: Postoperation TACE treatment modality was superior to surgery alone for the treatment of hepatocellular carcinoma. Objective: The aim of this retrospective study was to evaluate whether radiofrequency ablation (RFA) combined percutaneous ethanol injection (PEI) in the management of hepatocellular carcinoma (HCC) improves treatment outcomes. Patients and Methods: We retrospectively included 66 HCC patients who received RFA or RFA plus PEI from February 2011 to January 2014 in Jingmen No. 1 People's Hospital. Moreover, 31 cases received RFA plus PEI as the experiment group and 35 subjects treated with RFA aloe as the control group. The overall survival and treatment related complications were compared between the two groups. Results: For RFA group, the 1-year, 2-year, and 3-year survival rate were 82.0%, 69.3%, and 30.7%, respectively, with the median survival time of 27.1 months. For RFA plus PEI group, the 1-year, 2-year, and 3-year survival rate were 97.1%, 73.9%, and 37.5%, respectively, with the median survival time of 33.6 months. The overall survival of the two groups was not statistical different with the hazard ratio of 1.48 (P > 0.05); three cases of treatment associated complications were found in RFA group with 1 abscess, 1 pleural effusion, and 1 portal vein thrombosis. Moreover, 2 cases of complication were recorded in RFA plus PEI group with 1 pleural effusion and 1 portal vein thrombosis. The complicated incidence rate was not statistical different between the two groups (P < 0.05). Conclusion: The combination treatment of HCC was safe and had a slightly higher primary effectiveness rate than RFA alone. Objectives: The purpose of this study was to evaluate the predictive value of recurrence for serum hypoxia inducible factor-1α (HIF-1α), C-reaction protein (CRP) in hepatocellular carcinoma patients after transcatheter arterial chemoembolization (TACE). 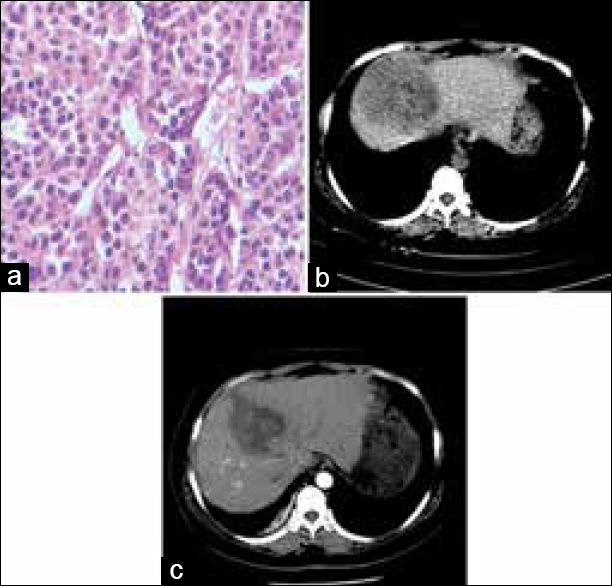 Patients and Methods: Fifty-eight hepatocellular carcinoma patients treated with TACE were included in this study from February 2010 to January 2013 as the case group. Of the included 58 cases, 47 patients had recurrence disease, and other 11 cases had no recurrence disease within 2 years follow-up. Moreover, 62 subjects with no benign liver disease were recruited as a control group in the same period. The serum level of HIF-1α and CRP were tested in case group and control group 1-week after TACE. The serum level of HIF-1α and CRP were compared among the recurrence, nonrecurrence, and benign liver disease patients. The predictive value of recurrence for serum HIF-1α, CRP was calculated by Bayes' theorem. Results: The serum HIF-1α and CRP level was arrayed 1-week after TACE. For recurrence cases, the serum level of HIF-1α and CRP was 2457.00 ± 335.70 pg/ml and 11.46 ± 3.25 mg/L. For nonrecurrence subjects, the serum level of HIF-1α and CRP was 2067.00 ± 175.900 pg/ml and 8.99 ± 1.70 mg/L. Moreover, for the benign liver disease patients, the serum level of HIF-1α and CRP was 1897.00 ± 121.33 pg/ml and 6.11 ± 1.2 mg/L. The serum level of HIF-1α and CRP was significantly higher in hepatocellular carcinoma patients than that of benign liver disease patients (P < 0.05); The recurrence predictive sensitivity and specificity of HIF-1α for hepatocellular carcinoma patients after TACE chemoembolization was 76.60% and 81.82% with the area under the curve (AUC) receiver operating characteristic (ROC) curve of 0.85; The recurrence predictive sensitivity and specificity of CRP for hepatocellular carcinoma patients after TACE was 65.96% and 63.64% with the AUC/ROC of 0.74. Conclusion: The serum level of HIF-1α and CRP was elevated in recurrence patients which could be a potential marker for recurrence prediction. Purpose: To improve patient comfort and reduce complications, clinical benefit of a transradial approach for transcatheter arterial chemoembolization (TACE) was evaluated in patients with hepatocellular carcinoma (HCC). Methods: A total of 284 patients with HCC for TACE was divided into transradial approach group (n = 126) and transfemoral approach group (n = 158). These two groups of cases were retrospectively compared with regard to complications, the procedural time, X-ray exposure time, length of hospitalization, and hospital costs. Results: There were lower incidence rates of complications including abdominal distension (42.85% vs. 87.97%, P> 0.001), vomiting (53.17% vs. 77.22%, P < 0.001), lumbago (1.59% vs. 97.46%, P < 0.001), and dysuria (0% vs. 62.03%, P < 0.001) in the transradial group as compared with the transfemoral group. The time required for catheterization and total X-ray exposure time were less in the transradial group compared with the transfemoral group (Pall < 0.001). The hospital stay time and costs required for catheterization were less in the transradial group compared with the transfemoral group (P < 0.001 and P = 0.001, respectively). In addition, hepatic angiography and TACE were completed in 100% and 99.2% cases in transfemoral and transradial groups, respectively. Conclusions: Transradial approach for TACE improves quality of life in patients with HCC by offering fewer complications and lower costs compared with transfemoral approach. Objective: The association between Chlamydia pneumoniae infection and lung cancer risk was not clear with small number of cases in each study. The aim of this meta-analysis was to evaluate the correlation between pneumonia infection and lung cancer risk by pooling the open published papers. Materials and Methods: We searched the electronic databases of Medline, EMBASE, Web of Science, and China National Knowledge Infrastructure databases for publications related to the association between pneumonia infection and lung cancer risk. Odds ratio (OR) and its 95% confidence interval (95% CI) was used to assess the correlation. The data were pooled by Stata11.0 software (Stata Corporation, College Station, TX, USA). Results: Thirteen publications, involving 2549 lung cancer patients and 2764 controls were included in this meta-analysis. The pooled results indicated that the C. pneumoniae infection significant increased the risk of lung cancer OR = 2.07 (95% CI: 1.43–2.99) by random effect model. And for serum IgG, 12 publications reported the IgG positive rate in lung cancer patients and relative healthy controls. The pooled OR was 2.22 (95% CI: 1.41–3.50) by using the random effects model which indicated that the IgG positive rate was significantly higher in lung cancer patients than that of healthy controls. 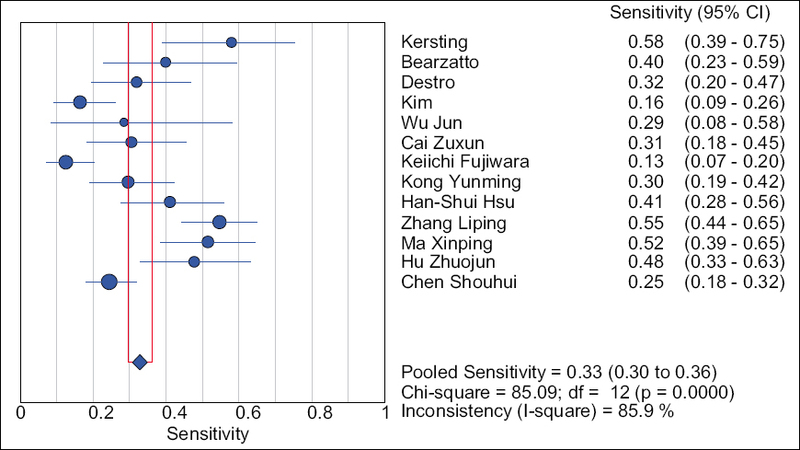 The sensitivity analysis indicated the pooled OR was not sensitive to a single study. However, Begger's funnel plot and Egger's line regression analysis indicated significant publications bias for this meta-analysis. Conclusions: According to the present published data, C. pneumoniae infection may increase the risk of lung cancer. However, for its significant publications and heterogeneity among the included studies, the conclusion should be interpreted cautiously. Objectives: To evaluate the diagnostic value of serum p16 gene promoter methylation for diagnosis of nonsmall cell lung cancer (NSCLC). Materials and Methods: By searching the databases of PubMed and CNKI, we included all the published articles related serum p16 gene promoter methylation and nonsmall lung cancer. The true positive, false positive, false negative, and true negative data for each included publication were extracted by the reviewers. The diagnostic sensitivity, specificity, positive likelihood ratio, negative likelihood ratio, and area under the receiver operating characteristic (ROC) were pooled by MetaDiSc1.4 software. Results: Finally, 13 manuscripts with 1440 subjects were involving in this diagnostic meta-analysis. The pooled sensitivity and specificity were 0.25 (95% confidence interval [CI]: 0.18–0.32) and 0.95 (95% CI: 0.93–0.97), respectively, with randomized effect model. The pooled positive likelihood ratio and negative likelihood ratio were 5.08 (95% CI: 3.00–8.62) and 0.69 (95% CI: 0.62–0.77) with fixed effect model and randomized effect model, respectively. The diagnostic ROC curve for the included 13 publications was pooled by statistical software MetaDiSc14.0 according to the Bayes theorem. The pooled area under the ROC was 0.72 with its standard error of 0.10. Conclusion: According to the published articles, high specificity and low sensitivity were found in this meta-analysis for the p16 gene promoter methylation in the diagnosis of NSCLC. Background: Protein kinase CK2 is widely expressed in eukaryotic cells, and plays an important role in cell proliferation, migration, apoptosis, etc. The aim of the current study is to explore how Quinalizarin, a specific CK2 inhibitor, affects the cell proliferation, migration, and apoptosis of different pathological and genetic types of human lung cancer cell lines. Materials and Methods: MTT assays were performed to evaluate the cell viability after being treated by Quinalizarin. Transwell migration assays were used to assess whether Quinalizarin could suppress cell migration. Flow cytometry was employed to test the apoptosis rate of different cells. 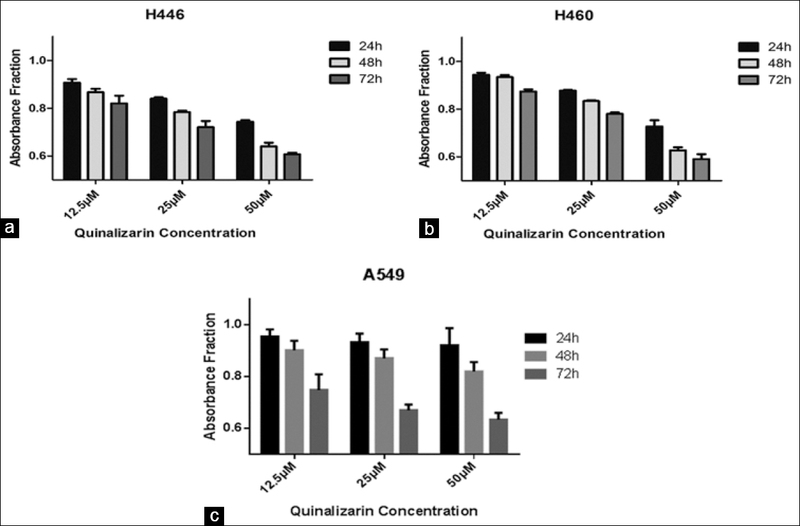 Results: After being treated by Quinalizarin, the viability of different pathological types of lung cancer cells (H446, H460, A549) were significantly suppressed in a time and dose-dependent manner. More interestingly, in a serial of human lung adenocarcinoma cell lines with different epidermal growth factor receptor (EGFR) mutation status, Quinalizarin was shown to have a much better ability to reduce the viability of cells with EGFR sensitive mutation than those with resistance mutations. Meanwhile, we also found that the cell migration of different pathological types of lung cancer cells (H446, H460, A549) was significantly decreased by Quinalizarin dose-dependently. In addition, the apoptosis rates in those cells were proved to be increased after exposed to Quinalizarin. Conclusions: Quinalizarin, the specific CK2 inhibitor, could reduce cell viability with emphasis on adenocarcinoma cells harboring EGFR sensitive mutation, suppresses migration, and accelerates apoptosis in different human lung cancer cell lines. Background: Nonsmall cell lung cancer is the leading cause of cancer mortality worldwide because of distant metastasis and frequent recurrence. Only few reliable and easily accessible tumor markers have been clinically implemented to the early nonsmall cell cancer prognosis. OBJECTIVE: The purpose of this study is to detect the expression of CUG-binding protein (CUGBP1) and assess the prognostic significance of CUGBP1 in early stage (IB) lung adenocarcinoma patients. Materials and Methods: Using quantitative reverse transcription-polymerase chain reaction (PCR) and immunohistochemistry (IHC) analysis, we detect the expression of CUGBP1 and assess their correlation with clinicopathological parameters by Chi-square test. Time to progression (TTP) was used as a recurrent index and was evaluated by univariate and multivariate analysis in the Cox hazard model. Results: Using PCR and IHC analyses, the expression of CUGBP1 and CUGBP1 messenger RNA (mRNA) had a close relationship with differentiation and vascular–invasion (VI). However, there were no significant differences between the CUGBP1 mRNA expression and CUGBP1 protein expression in IBlung adenocarcinoma. Using univariate and multivariate survival analyses, we found that CUGBP1 and VI were independent prognostic factors for IBstage adenocarcinoma individuals postsurgically. Conclusions: High expression of CUGBP1 could enhance the recurrence rate of adenocarcinoma and predicts an adverse postsurgical survival of TTP. 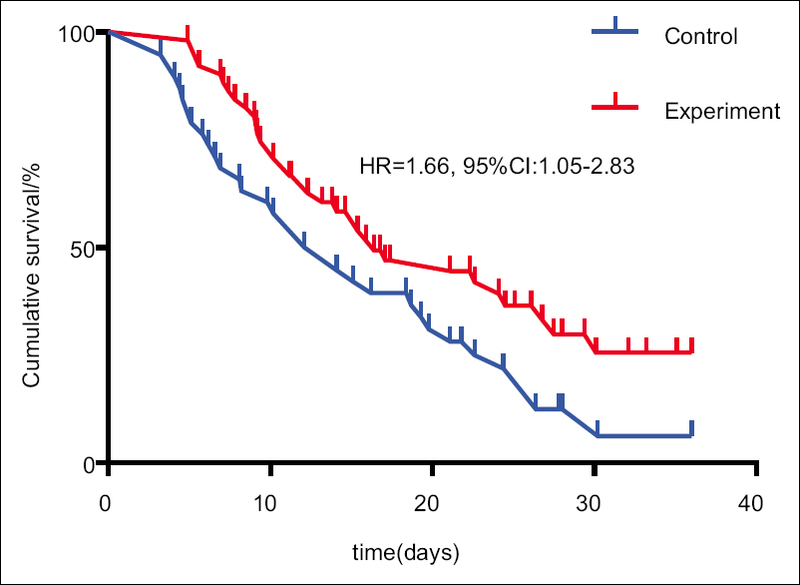 Combination of CUGBP1 and VI detecting could be considered as indication to predict prognosis of IBstage adenocarcinoma in the clinical trial. Purpose: Due to the improvement of thoracoscopic thchnology and surgeon's ability, plenty of nonsmall cell lung cancer (NSCLC) was treated by video-assisted thoracic surgery (VATS). This study was designed to evaluate the quality of life (QOL) and survival in II stage NSCLC patients following lobectomy, comparing VATS with thoracotomy. Methods: Between 2010 and 2012, 217 II stage NSCLC patients (VATS: 114 patients, OPEN: 103 patients) were enrolled in a long-standing, prospective observational lung cancer surgery outcomes study. Short-form 36 health survey (SF-36) and time to progression (TTP) were measured to evaluate the QOL and postoperative survival. Results: There were significant differences between the two groups in the preoperative radiation therapy and differentiation, and the VATS group had less postoperative complication, blood loss, intraoperative fiuid administration, and shorter length of stay. Statistical analysis of SF-36 questionnaire revealed that VATS group score was higher on seven health dimensions: Bodily pain (BP), energy (EG), general health, physical functioning, mental health, SF, and role-physical (RP), but only BP, EG, and RP have statistical signifiance. Using survival analysis, there was no significant difference between VATS and OPEN group, in which the mean TTP of VATS group is 18.5 months, while OPEN group is 20 months. Conclusions: VATS lobectomy tends to score higher on the QOL and functioning scales and has equivalent postsurgical survival compared with OPEN lobectomy for II stage nonsmall cell carcinoma patients. Objectives: Although more and more video-assisted thoracoscopic surgery (VATS) lobectomies via two-port have been performed to treat early-stage nonsmall-cell lung cancer (NSCLC) in recent years, concern remains whether it can achieve satisfactory adequacy of lymphadenectomy. This retrospective study was aimed to evaluate the adequacy of lymphadenectomy by VATS via two-port, compared with three-port. Materials and Methods: The clinical and pathological data of patients who underwent VATS lobectomy via two-port or three-port with systematic lymphadenectomy for clinical early-stage NSCLC were reviewed. As the main evaluation criterion, the number of mediastinal nodes and node stations, and the total number of nodes and node stations was compared by approach. Results: 1872 patients with NSCLC underwent VATS lobectomy, 1086 via a two-port approach and 786 through a three-port approach. In the two-port and three-port groups, the baseline patient characteristics were similar, and there was no significant difference in the mean number of dissected mediastinal lymph nodes (MLNs) (12.3 ± 2.2 and 13.1 ± 1.7, P > 0.05) and the mean number of dissected MLN stations (3.5 ± 0.7 and 3.4 ± 0.8, P > 0.05). Meanwhile, the mean total number of dissected lymph nodes (24.1 ± 4.2 and 25.7 ± 4.3, P > 0.05) and the mean total number of dissected lymph node stations (6.8 ± 1.3 and 6.9 ± 1.1, P > 0.05) were also similar. Otherwise, in terms of postoperative complications, there was no obvious difference in the two groups. Conclusions: The adequacy of lymphadenectomy including MLN dissection by VATS via two-port is similar to that via three-port for patients undergoing lobectomy for clinical early-stage NSCLC.